As a local business, reviews are your lifeblood – research shows that positive online reviews are the most important factor for consumers who are considering a purchase. However, we’re now learning that reviews from Google My Business (GMB) can affect SEO ranking, as well as consumer decisions. GMB is worth paying attention to – according to the same research noted above, Google is now the number one site for rankings and reviews, in terms of total volume. Online reviews represent an unbiased opinion about a business. Reviews are crowdsourced information, which (ideally) isn’t coming from the business owner or someone paid to promote it. As such, it’s little surprise that Google now factors reviews into its SEO rankings. Google’s affinity for reviews is similar to the way the search engine rewards businesses that receive backlinks from other websites – the more other people are talking about your business, the higher Google ranks your site. Google doesn’t reveal the rationale behind its search algorithm, but there are a few things that we can infer about how Google uses reviews in its search results. Here are three things to know about reviews on Google My Business. Now that Google is deprecating Google+ and adding local-focused features to Google My Business, reviews on GMB are becoming a more significant factor for SEO. 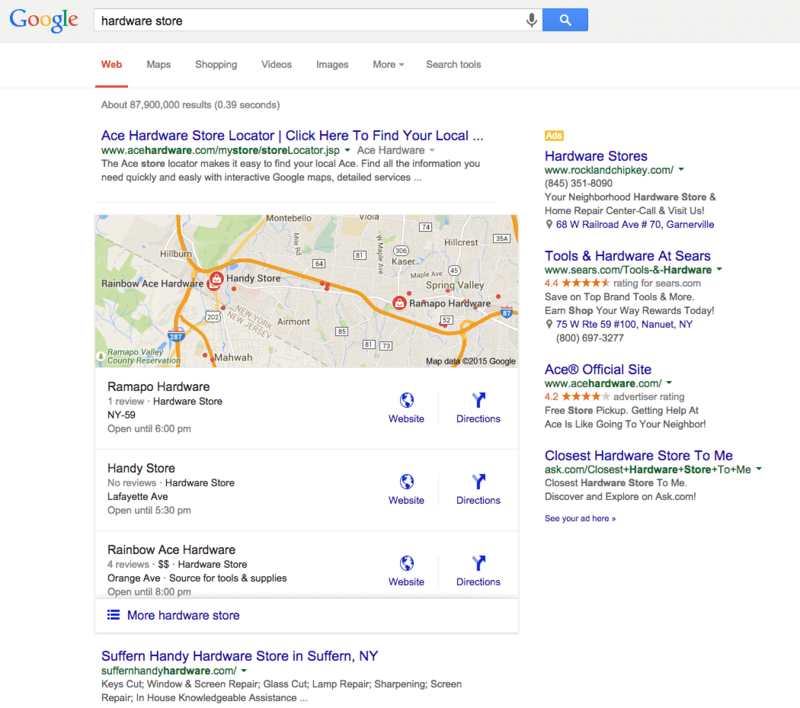 In fact, reviews that contain keywords are the second biggest SEO factor for determining where a local business shows up in the “local pack.” The “local pack” is the box at the top of the search results, under the map, which shows nearby local businesses that match the searched term, and it’s the first thing consumers see after they perform a search. Reviews can help you rank for keywords, but there is another opportunity to add SEO content to your GMB page. Google Q and A is a GMB feature which displays crowdsourced questions, to which businesses and consumers can provide answers. 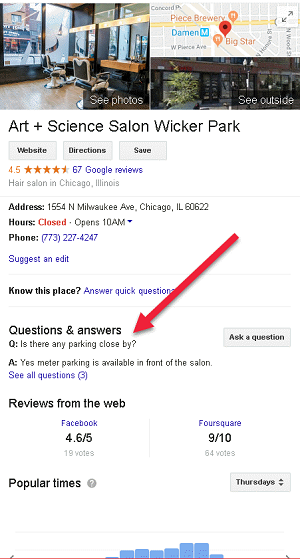 Like reviews, those questions and answers will also show up in search results if they feature keywords. Google does allow business owners to pre-populate Google Q and A with common questions and answers – a feature that savvy business owners can take advantage of. You can fill those pre-populated questions and answers with keywords in an effort to improve your SEO rankings. You’ve likely heard about how much engagement matters on social media, but engagement is equally relevant to Google My Business. Instead of having consumers like your Facebook posts, or comment on your business’ photos, you’re hoping to see them leave reviews on GMB, and post questions on Google Q&A. By the same token, you can engage your consumers by responding to their reviews and answering their questions on Google Q&A. Google My Business has a support page titled, “How to Improve your Ranking on Google.” In that guide, Google recommends that businesses, “Interact with customers by responding to reviews that they leave about your business.” This hints that responses may affect SEO rankings. If nothing else, your response could change the way a customer feels about your business, and get them to change their negative review to a positive one. Research shows that 89% of consumers are willing to change a negative review based on how the business responds. As noted, reviews matter for reasons beyond SEO. Research also shows that ratings and reviews are the number one factor consumers use when choosing between local businesses, and more than 50% of consumers pass up companies with less than a 4-star rating. The better your reviews and ratings, the more likely it is that consumers will choose your business over a competitor. This is still related to SEO, however, because Google does seem to reward websites with a high organic click-through-rate. Having good reviews can increase your website traffic, which in turn boosts your SEO ranking, creating a positive feedback loop. Based on the above findings, we can conclude that Google My Business profiles – and the accompanying reviews – are crucial SEO components for local businesses. Be sure to claim and manage your Google My Business profiles, respond to reviews and post-keyword-rich questions and answers on Google Q and A to optimize your page for local SEO.